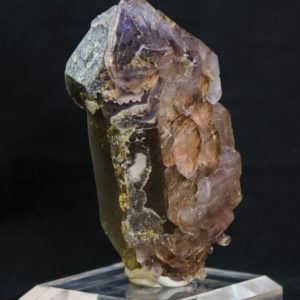 This appears to be two combined base crystals coated in hematite with a secondary super clear amethyst growth. 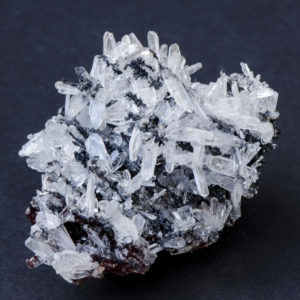 This piece is an oddity of nature and crystalline development. One of the base pieces has a post that could have meant it was a scepter growth, the other piece, probably a tabular growth. 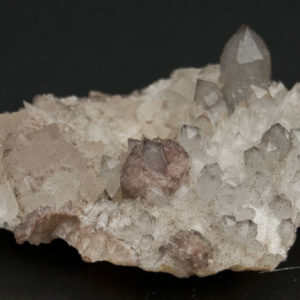 This piece is so unusual and unlike typical quartz patterns, it seems to be the crystal lovers’ favorite when viewed in person. Secondary growth has needle-like inclusions. This piece has no connection points.